A notable percentage of people have some motivation to reduce or completely eliminate gluten intake. Reasons vary from dietary choice to gluten sensitivity to serious medical conditions including auto-immune diseases like Celiac Disease. This may describe you or a friend or family member. Although commercial gluten free and reduced options are increasing in number, they are still few and far between. That’s even more true when it comes to gluten free homebrewing supplies. Only a few homebrew shops carry supplies and those supplies are generally slim. Enter Gluten Free Home Brewing. GFHB is a shop dedicated to offering gluten free supplies and brewing resources. Cross contamination is an issue for those with more serious allergy-like conditions. GFHB is dedicated gluten free so there is no risk of CC with gluten containing ingredients. Ingredient offerings include – malted gluten free grains… malted millet (pale, CaraMillet, crystal millet, medium, chocolate, dark roasted), buckwheat malt from Grouse Malting Company and Eckert Malting’s malted rice – crystal, amber, James’ brown, dark, gas hog, biscuit – and more. Along with ready made recipe kits (both extract and all grain) hops, yeast and more. Gluten Free Home Brewing also offers how-tos, tutorials on GF Brewing along with a recipe sharing platform. This entry was posted in GFHB, Gluten Free, Gluten Sensitivity on December 1, 2018 by admin. This 100 percent Pure Brown rice syrup provides proteins and amino acids necessary for yeast nutrition, head retention and body along with color and flavor. Because it is filtered, clarified Brown rice syrup produces a very clear, finished beer without great difficulty or product loss often experienced when trying to filter out insoluble (but colloidal suspended) protein. This is a gluten free sugar source, and a great way to make gluten free beers. This entry was posted in Amazon, Fermentables, Gluten Free, Gluten Sensitivity, Ingredients on November 1, 2018 by admin. This entry was posted in GFHB, Gluten Free, Gluten Sensitivity, Great Deals on October 2, 2018 by admin. This entry was posted in Amazon, Fermentables, Gluten Free, Gluten Sensitivity, Ingredients on September 1, 2018 by admin. This entry was posted in Amazon, Cacao Nibs, Gluten Free, Ingredients, Organic on March 2, 2018 by admin. A valued HBF reader has launched a homebrew club specifically for people with gluten intolerance. 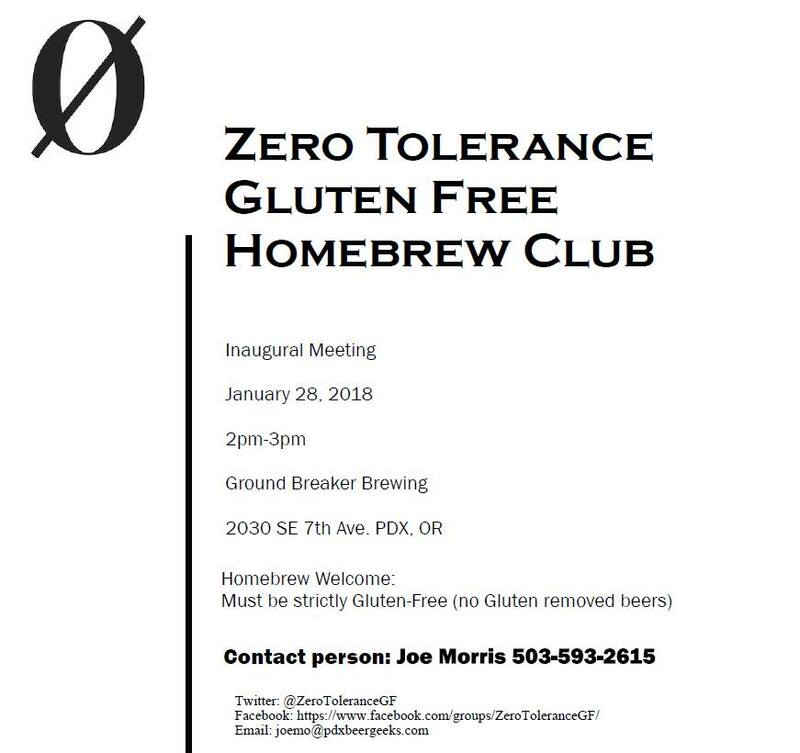 It will be a local club that meets in Portland Oregon at Ground Breaker Brewing, but will also have an online community component. The first meeting is coming up in January, click on the flyer above for complete info. Gluten Free Home Brewing. GFHB is a shop dedicated to offering gluten free supplies and brewing resources. Cross contamination is an issue for those with more serious allergy-like conditions. GFHB is dedicated gluten free so there is no risk of CC with gluten containing ingredients. Gluten Free and Gluten Reduced Homebrewing Resources – our resource page for those with Celiac Disease and similar gluten issues. This entry was posted in Gluten Free, Gluten Sensitivity, Great Deals, Homebrewing Community, New Releases on January 23, 2018 by admin. This entry was posted in Amazon, Fermentables, Gluten Free, Gluten Sensitivity, Ingredients on January 1, 2018 by admin. New from GFHB – Goldfinch Millet Malt – “Maple and bran flavors coupled with slight toasty cereal, honey and caramel tones. Perfect addition to Pale and IPA grain bills.” This malt is featured in Ghostfish Brewing Company‘s Goldfinch IPA. As of this posting, promo code GoldShirt takes $4 off two lbs of Goldfinch Millet Malt. This entry was posted in GFHB, Gluten Free, Gluten Sensitivity, Great Deals, New Releases on December 5, 2017 by admin. As of this posting, promo code GF5beer takes $5 off your GFHB order. This entry was posted in GFHB, Gluten Free, Gluten Sensitivity on August 3, 2017 by admin.